When you would buy a new KIMONO at a kimono shop, you firstly choose a TAN-MONO, lay out the form of KIMONO you want, and tailor a KIMONO to fit your body. I mean, you are not simply to buy a ready-made KIMONO, but to buy a TAN-MONO and then separately tailor KIMONO from it. 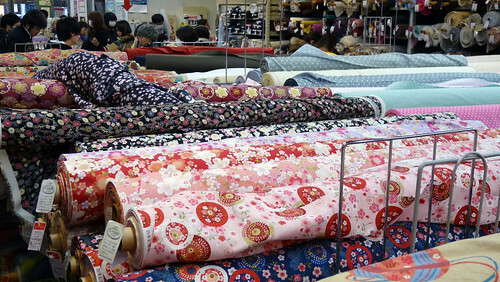 Such transaction form of custom-made or tailor-made is general in KIMONO industry still now. 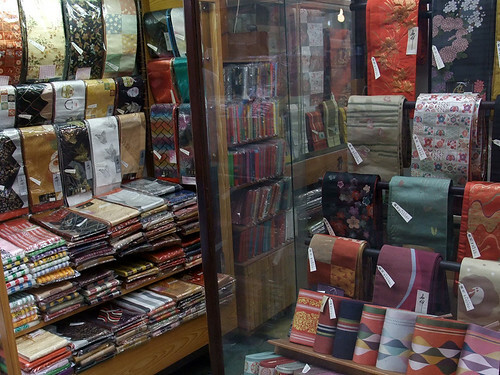 Although some kimono shop also deal with ready-made (or prêt-à-porter) KIMONO, most of those are limited to the easygoing line for beginners. Brand TAN-MONO, made through remarkably long multiple processes by a number of craftsmen, requires extraordinarily great care in comparison with industrialized fabrics. So it’s not uncommon to see that a TAN-MONO is priced over 1,000,000 yen. It’s just like fine art and craft, but not mass-produced goods. On the other hand, in these days we also have many selections of mass-produced TAN-MONO that is good for daily use KIMONO. You can buy a KIMONO with these economical TAN-MONO for total from several tens of thousands yen including tailor fee. 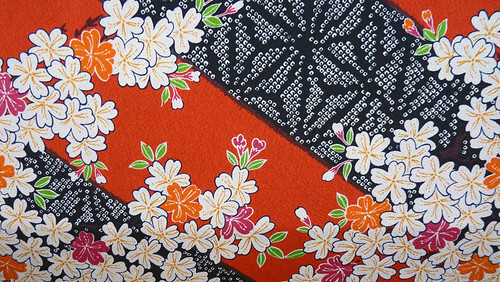 As shown in the figure below, TAN-MONO is cut straight across and sewn in the form of KIMONO. It is remarkable that TAN-MONO are cut into rectangles, so that whole parts are not wasted. And it is possible to restore original shape of TAN-MONO by disassembling KIMONO and stitch all parts together, and to re-tailor into other size of KIMONO so that a KIMONO can be used for three generations.